An Shih-kao (?-~170) (安世高; pinyin Ān Shígāo) was a prince of Parthia, nicknamed the «Parthian Marquis», who renounced his throne in order to serve as a Buddhist missionary monk. 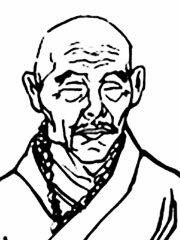 The prefix An in An Shih Kao’s name is an abbreviation of Anxi (Ch:安息), meaning Parthia in ancient Chinese: Anxi is a transcription of «Arsaces», the founder of the Arsacid Dynasty of Parthia. Most Parthian visitors who took a Chinese name received the An prefix to indicate their origin. In 148, An Shih Kao arrived in China at the Han Dynasty capital of Loyang, where he set up a centre for the translation of Buddhist texts. He translated thirty-five texts from the Theravada school of Buddhism. An Shih-kao is the first Buddhist missionary to China to be named in Chinese sources. Another Parthian monk named An Hsuan is also said to have joined An Shih-Kao at Loyang around 181 CE, where he took charge of translating Mahayana texts.